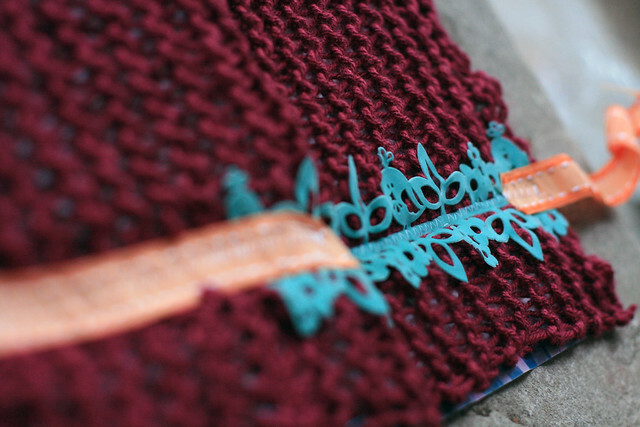 I got a few questions about how I knitted a cover for the art journal I used in my Living my Length and Width post (also featured in the Document Life Workshop challenge to Use Your Mail), so I thought I’d tell you how I did it! This isn’t a step-by-step tutorial; just an honest look at how I trial-and-errored until I got it. 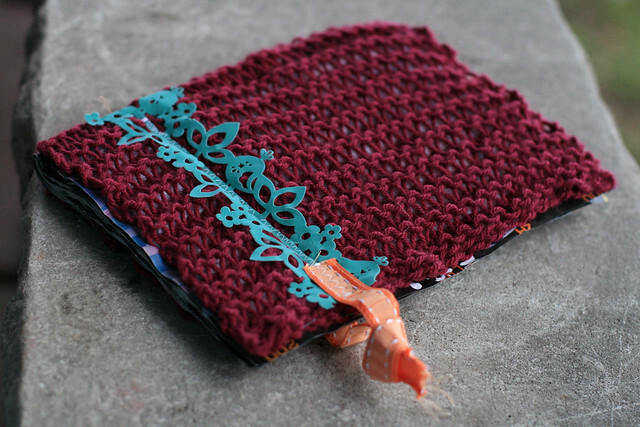 I first saw a knitted cover on a mini book by Emily Falconbridge in Ali Edwards‘s book Sharing Your Story: Recording Life’s Moments in Mini Albums , so the idea’s not original. But the book doesn’t explain how to do it, so I was flying solo there. 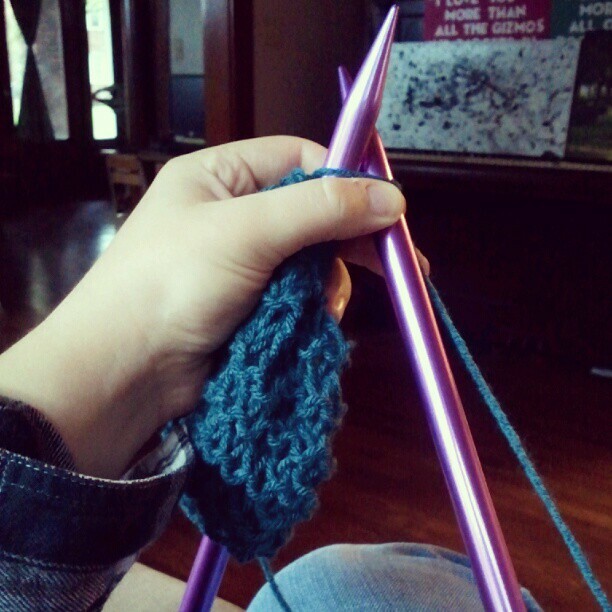 I’m still a novice knitter, for sure. I can’t even switch colors yet. And I taught myself to knit by watching a gazillion You Tube videos, so who knows if I’m actually doing things right (I know I use two different methods to cast on and cast off, so my edges don’t look exactly the same.) I also still can’t read patterns. I’m not going to let that stop me! I didn’t measure how many rows I needed, I just kept going until I had enough to cover the catalogue. This project was not about precision. I initially though that I would sew the knitted bit to the front page of the catalogue, but then I decided staples would be easier. I used pretty teal ones from Target (Teal! Staples! Wahoo!). You can see them along the back of the front cover, there. I then sewed bits of ribbon across the top. I did that so that the kitted part was attached to the cover in more places to keep it from sliding about. I couldn’t sew over the spine, so I sewed the front cover and the back cover separately. I used washi tape along my entry points for the thread instead of tying it off, so it wouldn’t come unraveled. I left extra ribbon going off of the sides so I can tie the art journal closed. On the whole it’s holding up really well, though Jonas pulled on the front a bit so I’ve got a weird loop sticking out of the front now. This project doesn’t have a long shelf-life, probably, but I’m making it just to play. 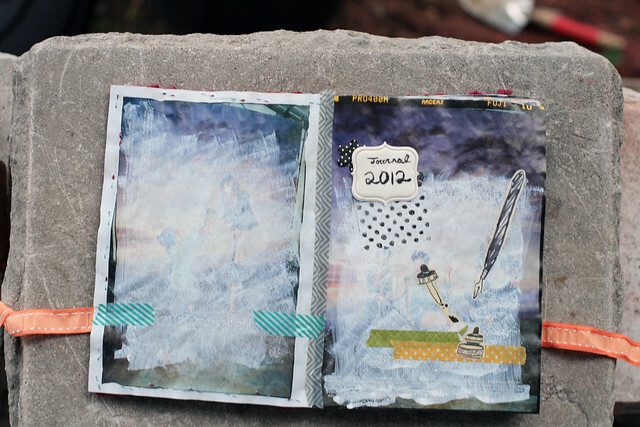 Have you ever mixed craft mediums together in an unexpected way? P.S. I’ve typed a little like a British person in places in this post. I’ve been having a Skins marathon, so you’ll have to excuse that. Oh! That looks awesome with the lace! Hey Megan! I am very intrigued as to what it means to ‘type like a British person’?! I I’m now reading through some of my blog posts to see if I am particularly British in them. Aside from when I speak about pavements and trousers and cups of tea of course! Hah! It’s just the word choice. I wrote “bit” and “bits” and “sliding about” when I’d normally put “part” “pieces” and “sliding around”. Just something I noticed when I was reading through for spelling and grammer errors.